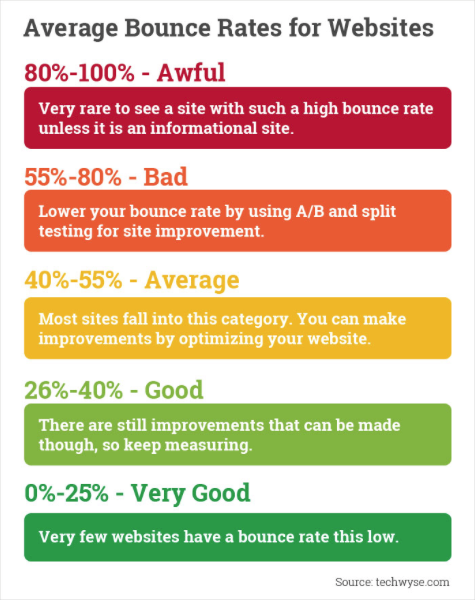 A bounce rate is the rate at which users bounce from your site. A bounce is a single-page session on your site. 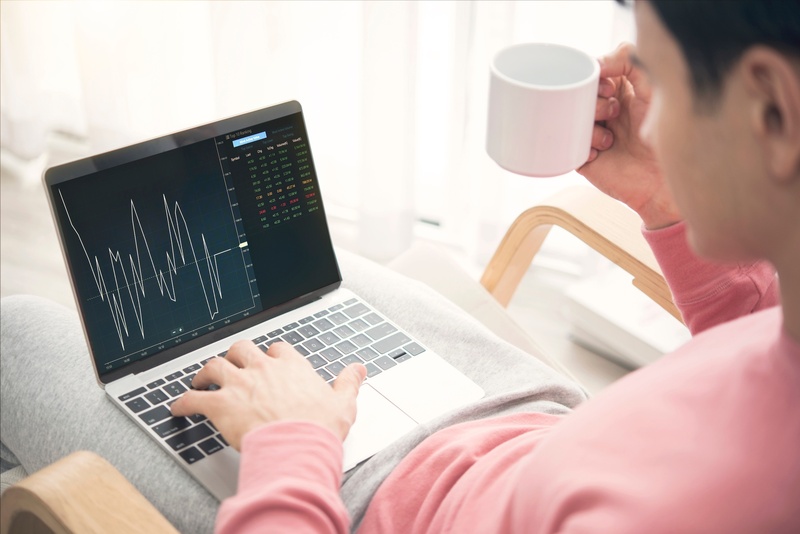 This means that a bounce rate is the number of single-page sessions (bounces) divided by the number of all sessions on your pages. 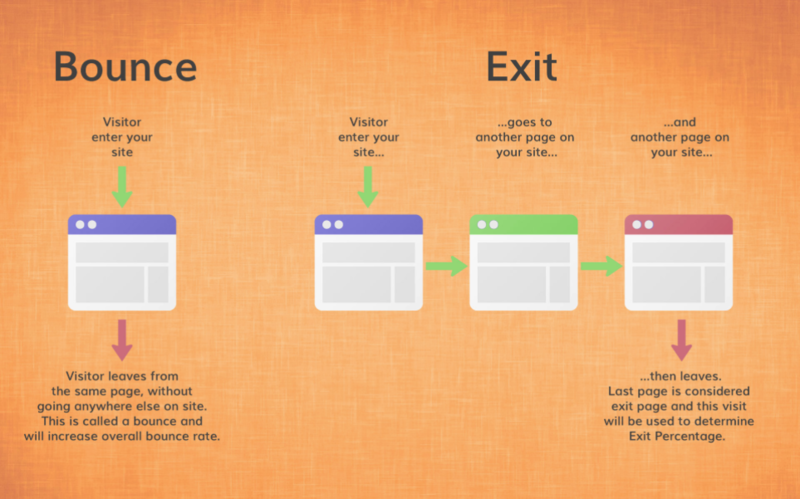 This means that if a user visited one of your pages, and left after without interacting with the page (e.g. clicking links or buttons); then they have bounced! This is true even if the user stayed on your page for a quite sometime, as long as she left your website after that single page without doing anything. The length of a session is a different measure altogether and does not affect whether a single-page session is a bounce. Use this 11-Step Checklist to streamline your next website redesign. Whether a certain bounce rate is good or bad will depend on what the purpose or intent of your page. If the main purpose of a page is for the user to interact with (e.g. a sign-up form, links to other parts of the site or other forms of CTA), then a high bounce-rate is not a good thing. Example A: A website's homepage is typically meant to be a portal to different pages of the site, as an overview. If this page has a high bounce rate, this means that users are not going to other parts of the site through the links in that page. Since the purpose of the homepage is to drive users onto the more important parts of the website, then having a high bounce rate on this page is not a good thing. Example B: Most websites will have a dedicated "e-club" page. This page will usually have a an embedded form that allows the user to subscribe to the website's email list. A high bounce rate in this page is bad because this means that most of the people visiting the page isn't interacting with the form in it, which is the whole purpose of the page. Example C: Most landing pages that have the intent of making users interact with CTAs should have low bounce rates as well. A high bounce rate will mean that users are simply leaving the page without interacting with the CTA. To sum it up: In order to have a low bounce rate, a high percentage of users coming in to your pages should be interacting with the page and letting the page fulfill whatever purpose it is supposed to be serving. On the other hand, if the page is expected to have single-page sessions (e.g.purely informational pages), then a high bounce rate is perfectly acceptable. Example A: user finds an article about dog grooming, the article is comprehensive and well-written, after reading the user leaves, feeling they have more than enough knowledge to groom their dog safely and properly. For this type of page, higher bounce rates are normal. Example B: If the purpose of your page is to send your users to a third party site (e.g. a food delivery service), then any user who arrives at your page and goes on to reach the third party page will be seen as a bounce. In this case, having a high bounce rate means that the page is fulfilling its purpose of sending users to the third party site, which is a positive. Example C: If you have a single-page website that serves a special purpose like WhatIsMyScreenResolution.com, then a high bounce rate is fine as users simply have nowhere else to go after viewing the page and accomplishing their objective. For this type of page, having a high bounce rate is acceptable. That doesn't mean clients won't be alarmed when they see those numbers soaring! If this is a problem, consider adjusting your bounce rates. This method should only be applied when it makes sense, otherwise you'll end up with a broken analytics setup that shows you incorrect data. If you are looking at your analytics page and wondering what your bounce rate percentage means, look below. What do bounce, user, session and other Google Analytics terms mean? Having a responsive, credible and functional website is a must. Contact us today to speak with a website professional and receive a free quote (951) 479-5411.